Quilted Creations is located on the town square in Headland, in Southeast Alabama and is near the border of Florida and Georgia. Our shop has been open since February 2011. We have been in the sewing and quilting business since 1985 and give the glory to God for all of His benefits. We are the home of the Ulmer Quilter, a wonderful hand quilting frame that we manufacture. We have a strong commitment to our customers, and consider them among our dearest friends. Come on in and see what fun things we can help you create! 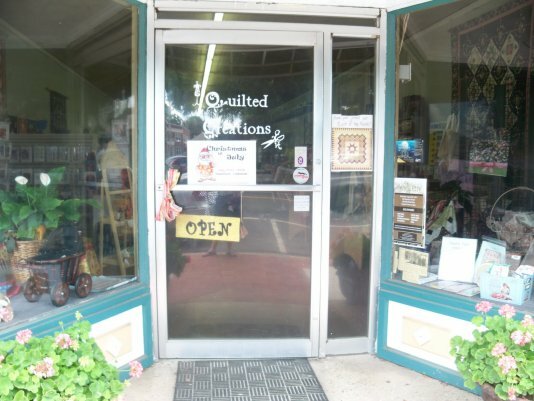 Quilted Creations is a small quilting business that started when my children were toddlers. I was interested in quilting with my mother-in-law, who passed away as we had just gotten our feet wet. I went to a local quilt guild in Columbus, GA where the patient help of kind older friends helped me to learn so much about quilting. I took my first formal quilting class at a shop there in Columbus, and knew that this was something I wanted to do. When a Gammill quilter came up for sale in the local paper, I went and looked at it, and bought it right away. I used it working for commercial decorators, making custom bed covers for a while. This moved into the quilting aspect right away. Since I had sewn since I was four years old, had an alteration shop, and worked with decorators, it was very enjoyable to find all of these new adventures in quilting awaiting. As I continued quilting and exploring new things, I was asked to teach a few classes, including a Beginning Quiltmaking class at Troy University Continuing Ed Dept. That was the beginning of my quilt teaching career, and it has continued for almost 25 years. I teach Basic Sewing and Quilting each week at my shop, Block of the Month Quilts each year, and Kid's Camp classes during spring break and summer, special quilting classes, and Spring quilting retreats. Each fall, I have the distinct pleasure of being the director of the Landmark Park Quilt show in Dothan, Alabama. With a love for antiques, and a history buff for a husband, I naturally fell into studying and dating antique quilts. I have formally studied quilt history for nine years and have taken all of the classes that the American Quilt Society has offered to begin my quilt appraisal business. These classes have taken me to Nashville and Knoxville, TN, Des Moines, IA and Paducah, KY. I am also a member of the American Quilt Study Group, and the Alabama Area Representative. I have traveled to AQSG seminars in Columbus, OH, San Jose, CA, and Minneapolis, MN, Cherry Hill, NJ and other places. Before I began my studies, I didn't realize the urgent need to have some quilts appraised and insured. After learning that a friend lost her entire quilt collection in a house fire, it concreted in my mind that many of us need to be sure to have the quilts that we cherish documented, appraised and insured.